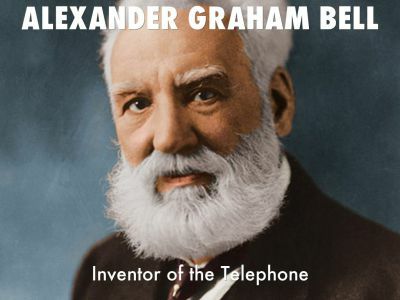 Around the time of his 11th birthday, he decided to become Alexander Graham Bell instead of just Alexander Bell. Perhaps he was tired of being the third Alexander in the family, sharing this first name with his father and grandfather. Whatever reason for the addition, Bell drew inspiration from one of his father's former students, Alexander Graham, to add "Graham" to the mix. Bell may have liked the ring of his new moniker, but he was still known to his family as simply "Alec" or "Aleck." 2. Bell was not only a talented inventor but a gifted teacher. He started out as an instructor at a boys' boarding school when he was only 16. His father had developed "Visible Speech," a system of phonetic symbols. These symbols showed how to make physically the sounds needed to say any word. Bell was able to use this system with deaf students to help them learn to talk and improve their diction. Bell also had some of his methods, too. His mother had suffered severe hearing loss after an illness as a child, and Bell had used different ways to communicate with her. While working in Boston, Bell became a well-regarded teacher of the deaf. He worked at the Boston School for Deaf Mutes and saw private students as well. Later Bell worked at the Clark Institution for Deaf Mutes and received a professorship at Boston University's School of Oratory. One of his students, Mabel Hubbard, eventually became his wife. Her father, Gardiner Greene Hubbard, became one of Bell's benefactors and supported his work on inventions. For another student, Bell developed special gloves with the letters of the alphabet on them, which allowed them to communicate through spelling words. Bell remained to committed to supporting education for the deaf throughout his life. He met with Helen Keller in 1893 and helped the young deaf-mute girl with locating a good teacher. That same year, Bell also established the Association for the Promotion of Teaching Speech to the Deaf. 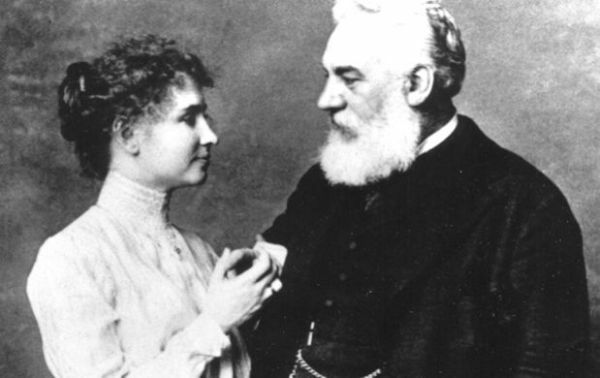 Helen Keller and Alexander Graham Bell. Keller’s parents reached out to Bell when Helen was a child, and he, in turn, contacted the Perkins Institute, which sent teacher Anne Sullivan to work with Helen. Yes, the early bird does catch the worm, or the patent, in this case. 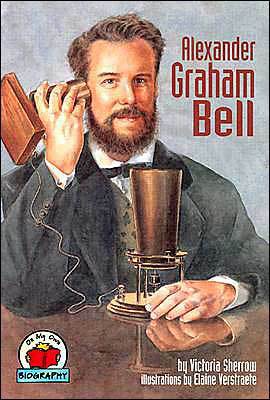 Bell filed his patent for his version of the telephone on February 14, 1876. 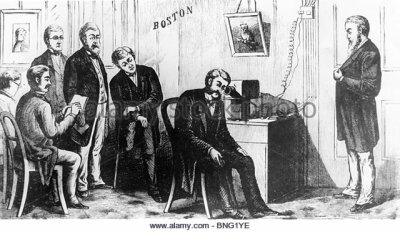 Later that same day, a lawyer working for Elisha Gray submitted a caveat, a type of announcement of an invention, for the telephone on his behalf. As he wrote to his parents in 1874, Bell had been aware of his competitor's efforts and felt enormous pressure to finish his design. 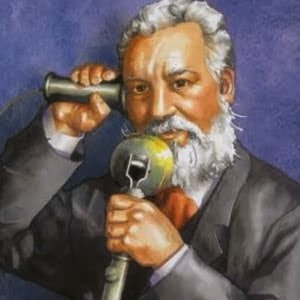 "It is a neck and neck race between Mr. Gray and myself who shall complete our apparatus first," he observed, according to Charlotte Gray's Reluctant Genius: Alexander Graham Bell and the Passion for Invention. In March 1876, Bell received the telephone patent. 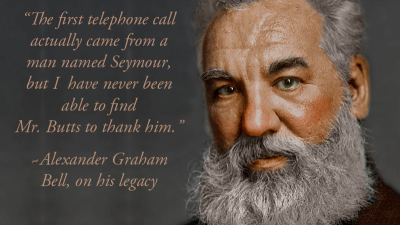 He founded the Bell Telephone Company with his father-in-law Gardiner Greene Hubbard, his assistant Thomas Watson and Thomas Sanders the following year. Competitor Western Union hired other inventors, including Elisha Gray, to develop their phone system, which led to a legal fight between the two businesses. Over the years, Bell vigorously defended his telephone patent in some other lawsuits. Bell created the photophone, which used light to transmit sound. Bell considered it to be one of his greatest inventions. He also used his gift for inventing to solve problems. After the death of his infant son in 1881, Bell made a metal vacuum jacket to help with breathing. This idea influenced the design of the iron lung device used to aid polio patients in the 1950s. When an assassin shot President James Garfield in 1881, Bell was asked to help the ailing leader. He came up with an electromagnetic machine to detect where the bullet was lodged in Garfield's body. It failed at this task (Garfield later died), but the device was a precursor to the modern metal detector. Alexander Graham Bell with his wife Mabel Gardiner Hubbard and their children Elsie May Bell (far left) and Marian Hubbard Bell, circa 1885.